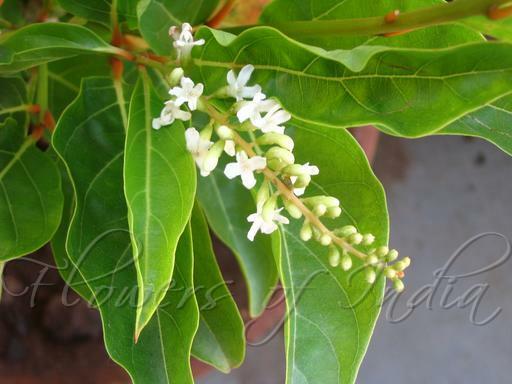 Native to tropical America, Fiddlewood is a beautiful shrub or a small tree with long tassels of richly scented white flowers. Flowers are pendant and cover the tree from spring to fall. Foliage is dark green, shiny, ornamental. Normally seen as a shrub, Fiddlewood can grow to about 40 feet tall in its native habitat. 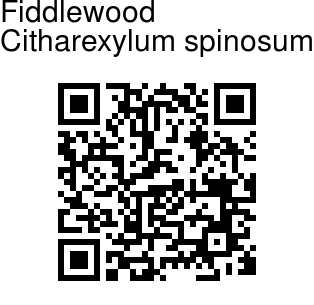 Fiddlewood makes a nice patio tree planted in the shade of pines or other tall trees. Young plants can be upright and rounded; older specimens develop a rounded vase form with lower branches removed. Fiddlewood is tolerant of sandy, dry soil and adapts to a wide range of soil pH including alkaline. Moderate salt tolerance allows planting near the beach. The tiny flowers are a favourite to the bees. The wood of this tree is said to be useful for making musical instruments - that could be the reason for its common name, fiddlewood.